Last week it was Dampier Peninsula and today another picture from Western Australia. I am in love with these colours out there – blue sky, red land and yellow bushes. 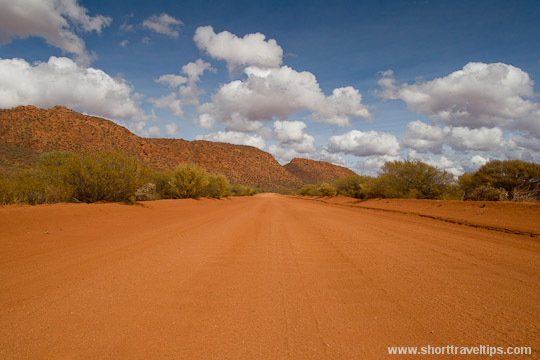 This picture was taken on the way to my climb to Mount Augustus in the middle of Western Australia. Which literally means it is in the middle of nowhere. Mt. Augustus is less known rock in Australia and is overshadow by famous Uluru rock, thought Mt. Augustus is twice the size of Uluru and is much older. Gorgeous photo! I love all the photos of Australia I see with the red rocks and the sky that’s always so blue – I must visit someday. My home state, and I have yet to climb that rock! I agree, the colors are amazing! Oh, those colors are so rich. Your photo looks like a postcard. Hope you enjoyed the climb. I’ve only recently moved to Australia, and I hope to be able to head into the outback soon. @Denise, where about in Australia you settled down? @Nate, you definitely should do that. I love remoteness of that place. @InsideJourneys, yes, I did enjoy it. Oh yes, I love the colours of outback Australia, too. I’m with you, these colors are beautiful. Love the red! What a beautiful colors of Outback Australia.